Can this super-cheap 2-in-1 really compete with more expensive alternatives? This is not a powerhouse – that’s going to take down the likes of say, DELL’S XPS 13 – A device that’s still our favourite windows ultrabook, despite the general design being a few years old now. THIS 2-IN-1 from budget Aussie retailer Kogan really is better than it has any right to be. With a unibody metal chassis, it both looks and feels incredibly sturdy and durable, and its 13.3-inch IPS display is better than what you often find on laptops for two (or even three) times this price. 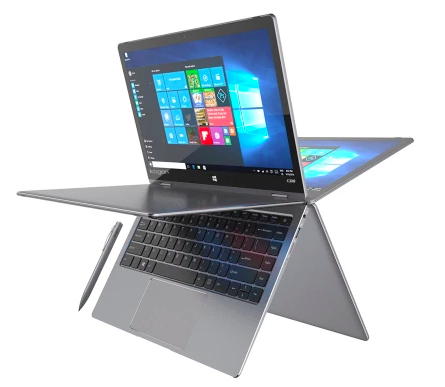 Don’t get us wrong, though: this is not a powerhouse that’s going to take down the likes of, say, Dell’s XPS 13 — a device that’s still our favourite Windows ultrabook, despite the general design being a few years old now. In fact, compared to that Dell, what’s under the C300’s hood looks rather sedate. Primarily powered by a quad-core 1.1-2.2GHz Intel Celeron N3450 processor — a chip that’s about a year and a half old at this point — in combination with a very basic Intel HD Graphics 500 GPU and 4GB of RAM, you won’t be doing any seriously demanding tasks. You can forget about video encoding or high- end image editing, and anything but games with simple 2D graphics or retro titles will be possible here. The storage on offer is adequate — 64GB of flash in the form of a SanDisk DF4064. That’s an embedded MMC (eMMC) drive, rather than an SSD. The eMMC format was born out of a desire to use cheaper flash storage on computing devices like tablets and netbooks — what you’re basically getting is an SD card soldered onto the motherboard. That’s not quite as dire as it sounds, however, because here, the flash storage does at least outperform a magnetic hard drive in most tasks, with sustained read and write speeds of 177MB/S and 102MB/S, respectively. What’s more difficult to deal with is the lack of space that 64GB results in. Disk formatting shenanigans and the considerable size of Windows itself consume about half the drive, leasing you with slightly under 30GB for your own use. Thanks to a built-in slot, you can add in a microSD card to supplement that, but a better option would be to grab an M.2 SSD to install — the addition of a 128 or 256GB SSD would transform this into a a much more well-rounded machine, but you will need to install that drive yourself, as Kogan sadly doesn’t offer it as an pre-configured option. The included charger is also a bit anaemic — it’s the kind of plug adapter you’d expect to come bundled with a cheap clock-radio, not a 13-inch laptop, and at 1.10m, the cable is a fair bit shorter than we’d like. On the upside, the combo of components in the C300 is at least good enough for any day-to-day task you can think of, from surfing the web and streaming videos on Netflix, to creating and editing Word docs or spreadsheets. It works reasonably well as a tablet, thanks to that fold-around screen (the hinges are surprisingly sturdy) and the keyboard and trackpad are comfortable and large. There’s even two full-sized USB 3.0 ports, a mini-HDMI output and a metal stylus included, too, and the battery lasts a good 4-6 hours, depending on the task. In other words, if your needs are relatively undemanding, this one punches well above its weight.